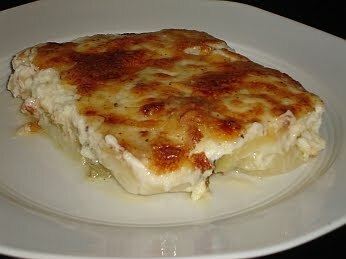 We have previously posted the recipe for Briam, which is a very simple and popular Greek dish. This recipe is called 'Politiko' Briam from the name 'Poli' which is what Greeks call Constantinopolis, and 'Politiko' recipes are from the Greeks who used to live there. The basic difference between this and ordinary Briam is the addition of Bechamel sauce on top. Do try it - you'll find it delicious! Cut the courgettes and potatoes into slices approx. ½ cm thick. Finely slice the onion and garlic. Place all the ingredients in a shallow oven dish along with the oil, water and salt & pepper. Bake in a preheated oven at 200 degrees Celsius for approx. 1 hour until all the water has been absorbed and it has a nice golden colour. 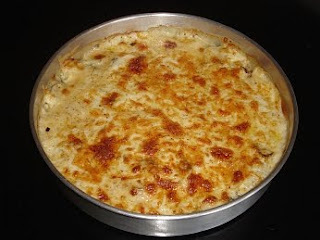 Spread the Béchamel over the baked food and put back in the oven at 160 degrees Celsius for approx. 30 minutes. Mmmm! This looks and sounds delicious. And it seems like a simple recipe too. Thank you!